Wow. Might have just got the award for worst blogger ever! haha! It has been waaaay too long. And we are finished with our challenge! Matt ended up losing 21pounds and I lost about 8 or 9 :) Not too shabby. Out of all the Paleo challenges I have done I would not say this was my best but it definitely was not my worst. I ate a lot of vegetables. I discovered (thanks to Britt) Cashew butter. 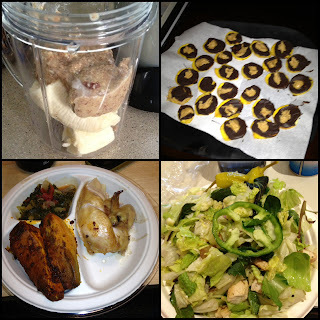 I almost ate 100 % Paleo in Alabama when we visited (minus some Mexican food) which is actually VERY DIFFICULT to do because there are barely any choices in the town Matt grew up in and I brought the magic bullet, almond butter and a bunch of bananas & made/lived off smoothies for an entire weekend. I also did not eat any of the 30 red velvet cupcakes that Matt's mom made and I had to stare at all weekend. That is an accomplishment in itself. But you want to know what gets me EVERY time? No matter how healthy I am- I can get to the point where I am not craving SUGAR or BREAD but I will crumble when faced with tortilla chips and queso aka cheese dip. I have no idea why. Maybe it is my comfort food? Maybe I have an emotional connection? Maybe it's because it is damn delicious. Who knows- all I know is that I have more trouble resisting chips & queso than I do a giant chocolate cake. Instead of going through EVERY recipe and meal we ate I will just post some pics and give you the low down on my new favorite and EASY recipe. Could we have ordered regular pizza? Yes. Would I have wanted to die the next day? Yes. Regular pizza is awesome don't get me wrong- but I LOVE this Against The Grain pizza. I don't know why- maybe it is because I choose my own fresh ingredients to top it with? Maybe because I don't get horrible stomach cramps the next day? Or maybe because it honestly is not NEARLY as bad for you as a regular, greasy pizza. That is all you need. 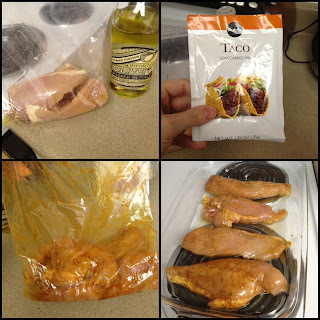 You take the chicken and throw it in a ziploc bag with some olive oil, put in half a pouch of taco seasoning, spread it around the chicken, place the chicken in a glass baking dish and put it in the oven at 350 degrees until its cooked through (Usually 30-40 min). BOOM. You now have some REALLY delicious chicken. 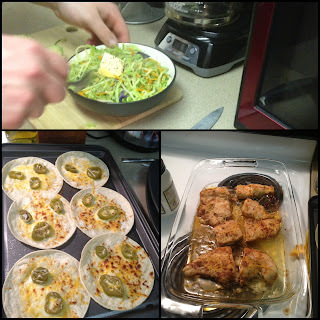 I served it with some corn (I know, not Paleo) tortillas with a little bit of cheese and jalepenos and some broccoli slaw. I have made this a few times and the other times I made it when we still were on our challenge and had no dairy I just served it with an avocado and a vegetable of choice (I have been using a lot of steam-able broccoli bags). I like this recipe because I can make it before CrossFit and stick it in the fridge then just cut an avocado, heat some broccoli and heat up the chicken when we get home. 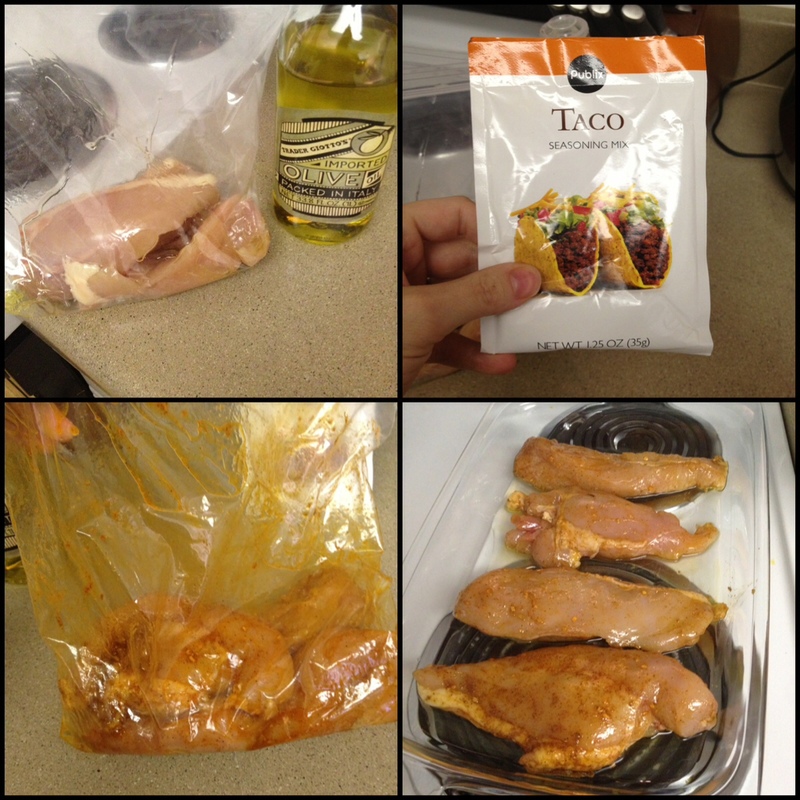 I am considering trying that pork I make but adding taco seasoning to it...we will see. I wasn't sure if I was going to write about this but I have been a pretty open book on here. I recently had to leave my job due to lack of hours for the employees. A few of us have been let go in the past month and it has been really tough. This happened last week and that has been another reason why I haven't been blogging. But I would like to say I have been pretty proud of myself for how I have handled it Paleo-wise. Food is a comfort for me. It always has been. I have been blessed with an extreme love for working out and athletics otherwise I think I would be 500 pounds due to my love for food- especially food that's bad for me. In the past when I have had a bad week I usually cope by grabbing a pint of chocolate ice cram or having a pizza. Granted- that is not the ONLY way I cope but I have been known to use food as one of my methods. This time I did have a couple glasses of wine and some chocolate (only a couple pieces) but I did not go off the deep end and it stopped that same night. I have been home alone now for over a week due to lack of a job. Although I keep myself busy- it would be very easy to sit at home and eat crap all day. I have only had a couple of bad days due to my arch nemesis chips and queso but quite honestly I have been eating salads for lunch, bananas for breakfast and preparing dinner early. I have tried to PLAN out my bad days and not just find myself ankles deep in candy wrappers and empty ice cream cartons. Have I been perfect? No. There is an empty bag of tortilla chips and left over queso in my fridge. But have I been terrible? No- I have done a better job than I would have usually. But at least I am admitting to and noticing this pattern within myself and now I can do a better job of coping in the future. Just a little better each time will make a difference. I just finished reading this book called Wholehearted Living by Dr. Brene Brown. She talks a lot about our tendency to NUMB our pain. She makes a really great point in her book- when we partake in numbing behaviors (alcohol, drugs, FOOD) we do NUMB the pain but we also numb the HAPPINESS. Numbing isn't selective- it numbs all emotions. I have been keeping that in mind while I have been feeling depressed this past week. I am going to head to Vegas to spend some time with my family tomorrow. Paleo will be tough and I won't commit to be 100% because I want a week off lol. It isn't easy eating healthy. BUT I will commit to eating at least 80% Paleo..mostly gluten free cause my stomach will hurt if not. Next- I am going to re-commit as of Monday when I get home. I need to speak with Matt but I feel another 30 day challenge is on our horizon (Paleo + dairy challenge). Finally- I am going to kick CrossFit up a notch. It has been a life saver this past week or so. I feel so much happier when I am working out consistently and I honestly can say I love the confidence and the purpose it gives me. 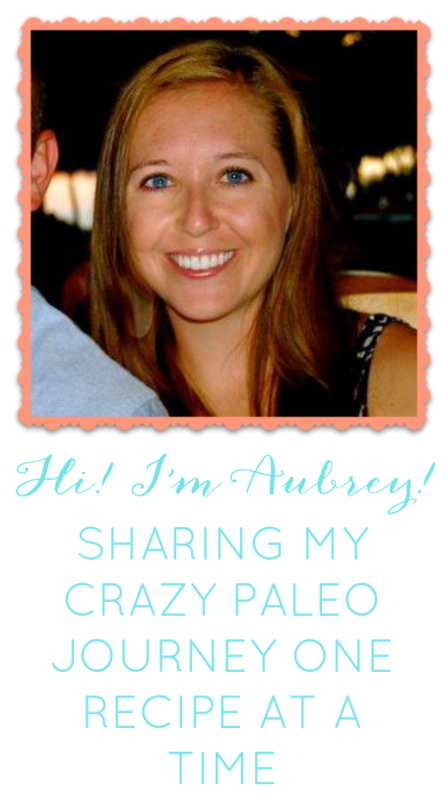 Hope anyone out there who is considering a Paleo challenge gives it a shot. It really can make a difference in your health and your life. Mine wasn't perfect this time- but I still got results and every time I commit to a challenge I become more and more convinced by this lifestyle and I know that is something I will do and I will pass on to my family. Happy eating!